One of the unique characteristics of the M42 mount has been its broad acceptance by many makers of lenses and cameras as a simple and practically universal basis for attachment of lens to camera. That acceptance has been based on the relative simplicity of the mount as well as non-proprietary character of its common forms. Dozens of makers have produced M42 mount cameras with Praktica and Pentax being the most prominent associated names. 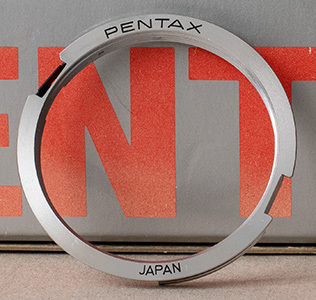 An even larger number of lens and accessory makers have supported the mount over the years such that there remains an impressive catalog of surviving vintage lenses and accessories compatible with current and legacy Pentax bodies. It is highly probable that more lenses and cameras have been made in M42 mount that any other. 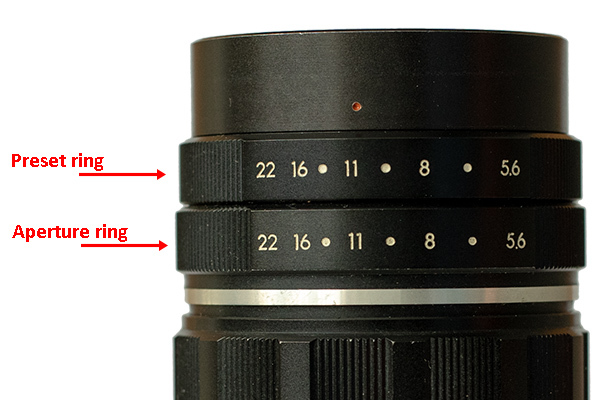 It is because of that ubiquity that M42 has been referred to as "Universal Screw Mount" along with the other common monikers "Praktica Screw Mount", "Praktica/Pentax Mount", and "Pentax Screw Mount". That fact has also been much appreciated by photographers able to adapt this rich source of quality optics to their camera system of choice. 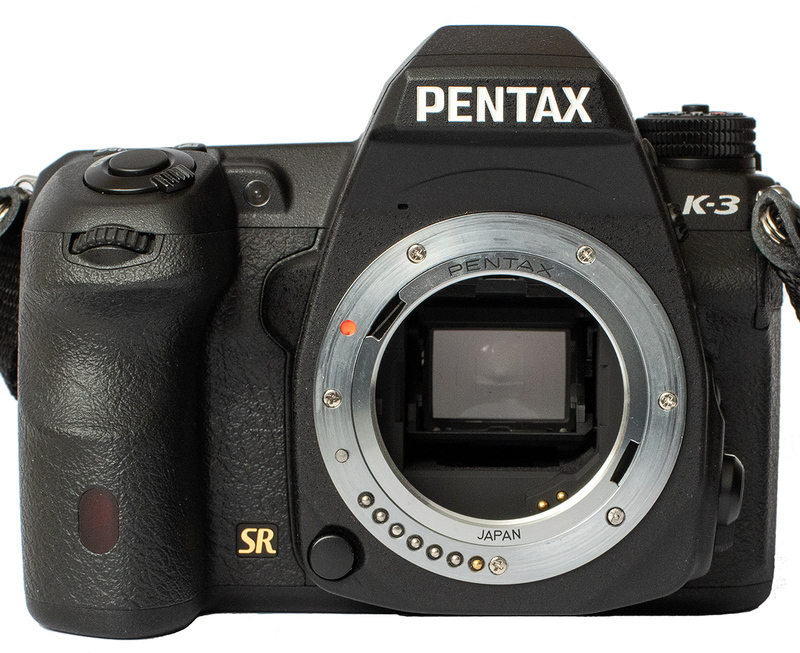 Requirements: What Must an SLR Lens Mount Support? As with the contemporary Exakta models, lenses were offered with either fully manual iris diaphragms or a so-called preset aperture mechanism. Manual aperture lenses required the operator to open the aperture fully with the aperture ring to focus and frame and then turn the aperture ring to stop down to the desired F-stop to actually shoot. Providing click stops allowed the user to count clicks, but the process was cumbersome at best. 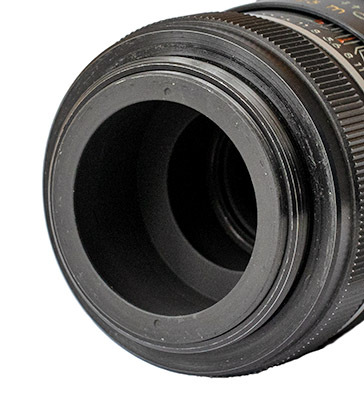 The availability of lenses with preset aperture mechanism was a huge boon to SLR photographers. These lenses allowed the user to focus and frame with the lens wide-open and allowed the lens to be stopped down to a preselected aperture just before exposure. 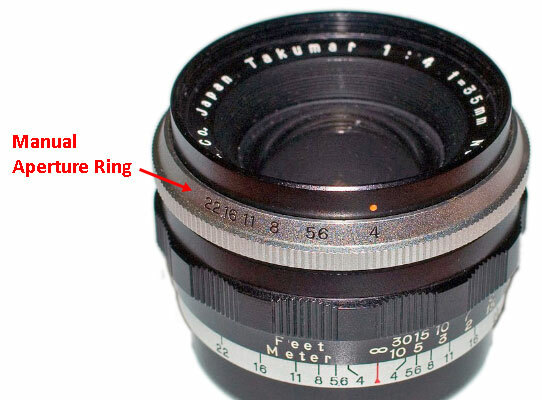 This was done by use of a lever or an additional ring on the lens barrel. With practice, the flow of meter the light, pre-set the aperture, focus, frame, stop-down, and shoot came quite naturally and was the standard for several years. Because of mechanical simplicity, easy implementation even on long lenses, and portability across mount types, pre-set lenses were the norm for much of the 1950s and remained popular well into the early 1970s with some lens types (e.g. tilt-shift) using this approach to this day. 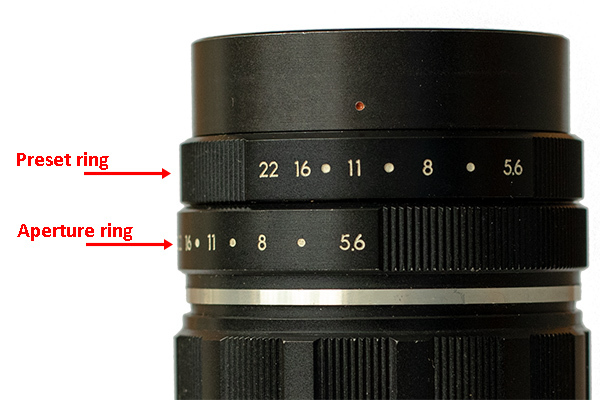 Preset lenses are easily identified by the lack of coupling pins or levers on the lens rear and by presence of a lever or "extra" aperture ring on the lens barrel. 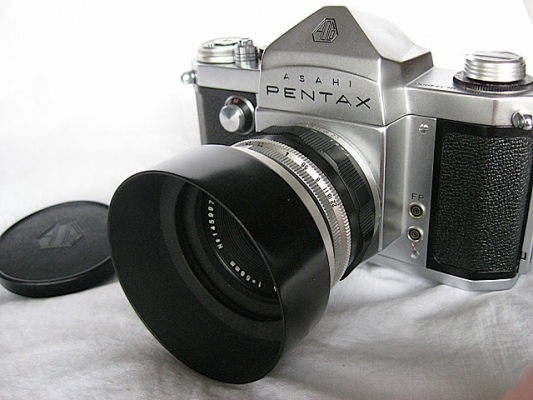 The original M42 Takumar lenses featured preset aperture mechanisms and were matched for use with the Asahi Pentax (AP) (1957) and Pentax S (1958) cameras. 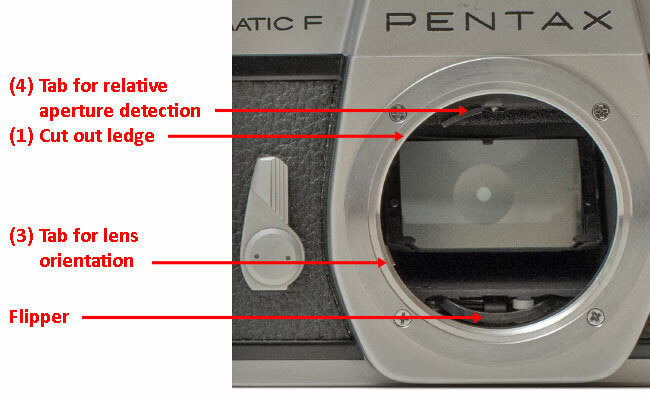 The Pentax K camera of 1958 was innovative in that it added a top shutter speed of 1/1000s, but its most significant new feature was that it, along with the 1956 Zeiss Contax F, used an M42 mount capable of supporting automatic aperture actuation. 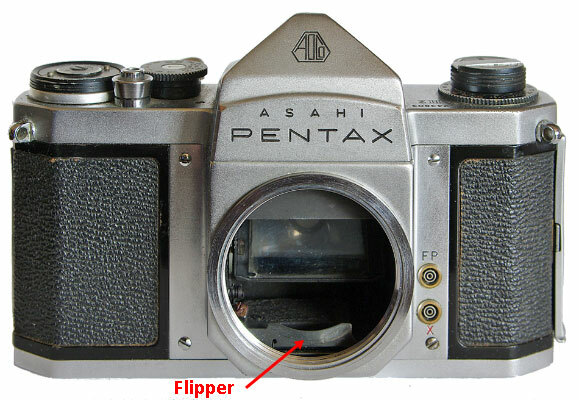 This was accomplished by use of a bar ("flipper") in the mirror box near the bottom of the mount that moved forward just prior to the shutter opening to depress a small pin on the rear of the lens to stop the lens down for exposure. 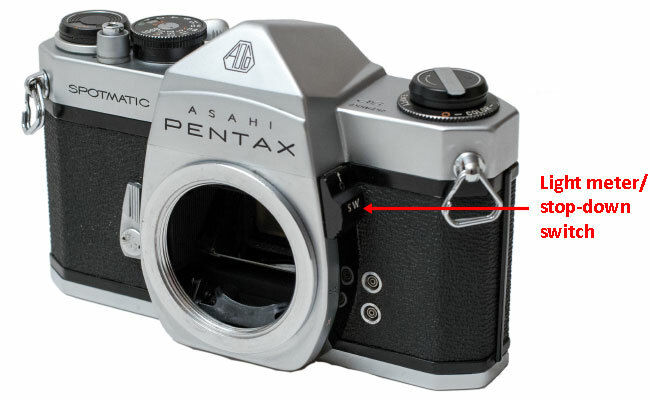 The bar actuator design was common to both makers and allowed backward compatibility to the growing number of German preset M42 lenses as well as Auto-Takumar lenses made for the Pentax K. The addition of the actuator bar to the mount was seminal, as shall be seen below and all Asahi screw mount cameras from the Pentax K forward featured a mount so equipped. The next innovation was development of a fully-automatic aperture mechanism capable of stopping down for exposure and reopening without user intervention. This improvement along with the earlier innovation of an instant return mirror allowed the photographer to easily address rapidly changing events and active subjects without removing their eye from the viewfinder. 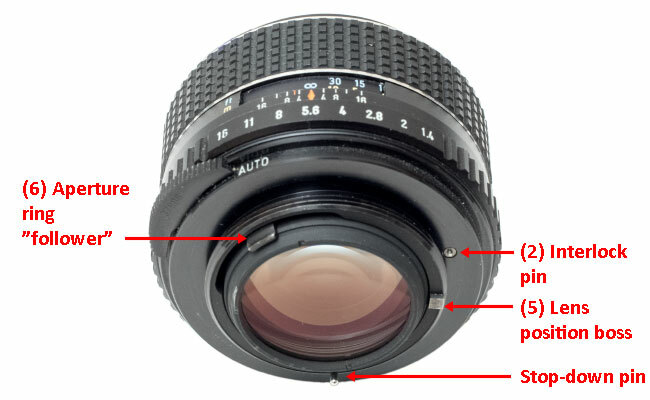 Fully-automatic aperture first made its appearance with Pentax in 1960 on some Auto Takumar lenses, but it was the Super-Takumar series that fully exploited this feature. As support for this feature was taken up by other makers of M42 cameras and lenses, it became commonplace to include "Auto" in the name for lenses having this feature, hence names like Auto-Rikenon, Auto-Yashinon, Auto Mamiya/Sekor, and so on. 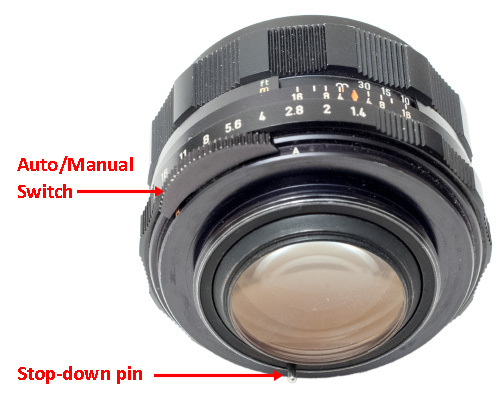 To allow backward compatibility with older-model bodies, most auto-aperture M42 lenses include a small switch or slider to allow either automatic or manual aperture operation. A happy side-effect of the Auto/Manual switch is that it effectively allowed operation equivalent to using a preset lens which comes in handy today when using these lenses on a digital SLR. Repeat #4 as needed until either light or subject changes. Later production bodies are free of this issue. Installing the adapter in the mount can be fiddly. The easiest way to do it is to first screw the adapter onto a lens, then mount the lens (with adapter), and finally screw the lens out leaving the adapter in place on the camera. You now effectively have a digital SLR with an M42 mount! 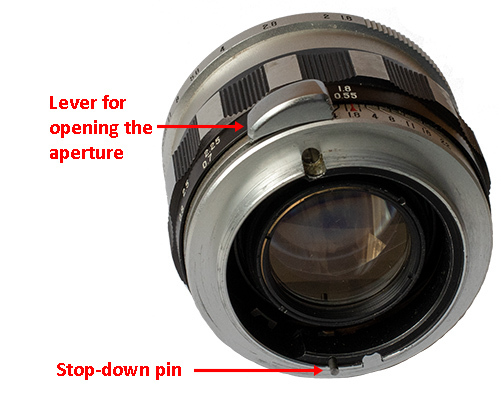 There is no aperture linkage between the camera and lens, so the lens must be stopped down manually to the working aperture for metering and before shooting. This can conveniently be done with the A/M switch if present. You nay have to set some exposure compensation to achieve proper exposure. The compensation value required may vary by lens and F-stop. This method works in live view as well as in viewfinder view. # The first Asahi Pentax model had no engraved model name. 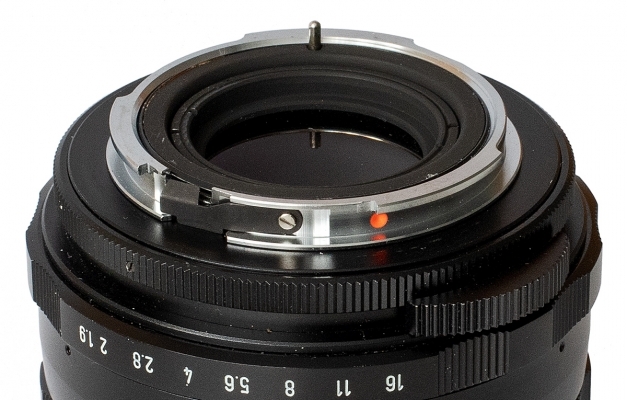 It is colloquially called "AP"
Any M42 lens can be used with any M42 camera. The features supported will be the least of what the lens and camera provide. There are a (very) few exceptions, though: refer the section "Variations and Compatibility" above. 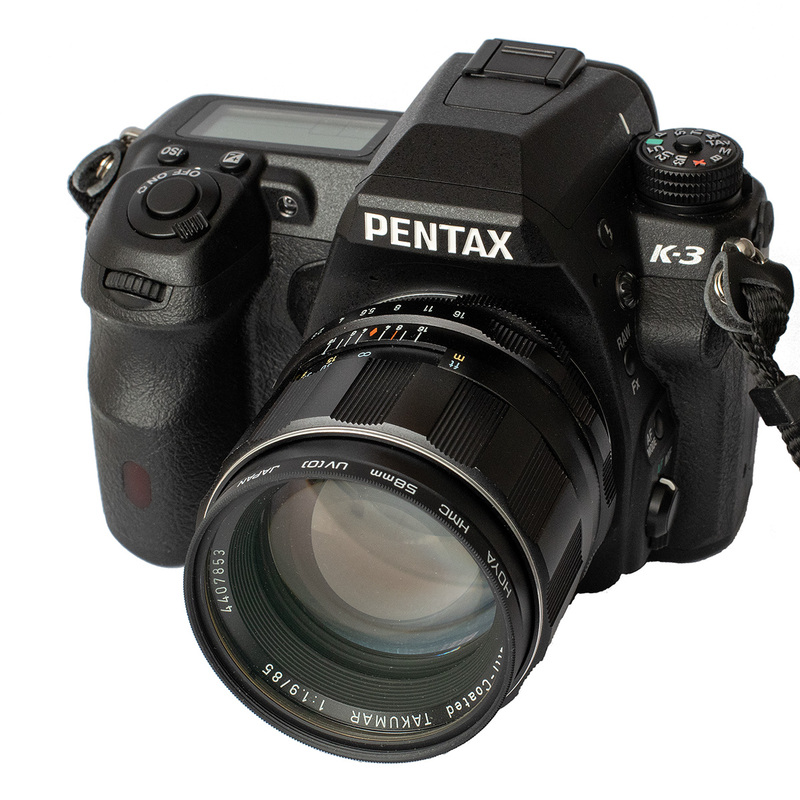 The M42 section of PentaxForums lens database includes information on the mount type and aperture mechanism of all Pentax screw mount lenses. Likewise, the M42 section of the camera database provides the mount information for all Pentax screw mount cameras.